In December, telecom operator Reliance Jio Infocomm announced that it will spin off the company's fibre and tower assets into separate entities - Jio Digital Fibre Pvt Ltd and Reliance Jio Infratel Pvt Ltd. In order to facilitate the demerger process, Jio Digital Fibre is reportedly turning to syndicated loans. Sources in the know told The Economic Times that the fibre network unit is raising about Rs 27,000 crore in syndicated loans from a consortium of banks as it expands to meet expected demand for its assets. SBI is reportedly advancing Rs 10,000-11,000 crore while ICICI Bank and Punjab National Bank have offered Rs 5,000 crore each and Axis Bank has committed Rs 6,000 crore. These loans, maturing in two years, would cost about 8.35-8.85%. The proceeds will go into strengthening Jio Digital Fibre and draw users from other companies and businesses. "Other telecom players can use this fibre network," a senior industry analyst told the daily, adding, "even those in the power industry can use these assets". Meanwhile, Reliance Jio Infratel is expected to be sold separately to Canadian investor Brookfield. Earlier this month, Jio Infocomm transferred control of its fibre and tower arms to Digital Fibre Infrastructure Trust and Tower Infrastructure Trust with the aim of deleveraging its balance sheet. Jio operates 2.20 lakh towers and over 3 lakh route kilometres of fibre. Jio, which reported its fifth straight profitable quarter (Q3) in January, has been aggressively putting the fibre network in place to deliver fibre-to-the-home (FTTH) services ahead of its shift to 5G. Jio GigaFiber has now entered the Area Ready for Sale (RFS) stage, under which Reliance Jio is reaching out to resident welfare associations in societies and private households to seek permission for deployment. While the exact rollout date hasn't been revealed yet, speculation is rife that the commercial launch of the service could take place anytime in the coming months. Initially, select users in Mumbai and Delhi circles will have access but the company plans to eventually extend its Jio GigaFiber services to 50 million homes across India. 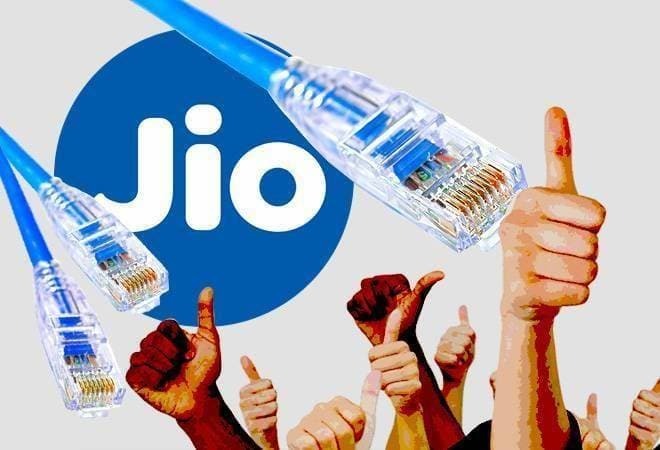 Experts say that with DSL and ethernet forming 75% of current fixed-line broadband connections, a strong fibre offering by Jio could drive market-share gains. Besides, in January, the Competition Commission of India gave Jio parent Reliance Industries the go ahead to acquire majority stakes in DEN Networks and Hathway Cable & Datacom - two of India's largest cable TV operators. The acquisition will give RIL access to 24 million existing cable-connected homes of these companies across 750 cities, thereby covering around half of its target of connecting 50 million homes. According to a January report by brokerage firm UBS, the oil-to-telecom conglomerate can become a market leader in telecom and media, while gaining significant share in retail/e-commerce. "Its success could be built on an ecosystem or bundling strategy, and a home-court advantage, similar to Alibaba's success in China, beyond explicit or implicit policy support," read the report. It added that the Mukesh Ambani company can potentially become a unique quadruple play by bundling connectivity, carriage, content and commerce to gain higher share of consumers' wallet. As per UBS estimates, the consumer-centric ecosystem can reportedly generate 47% of RIL's consolidated EBITDA by FY23.